Two studies in the October 23/30 issue of JAMA serve as fodder for reflection on the history and direction of critical care research and the hypotheses that drive it. Morelli et all report the results of a study of Esmolol in septic shock. 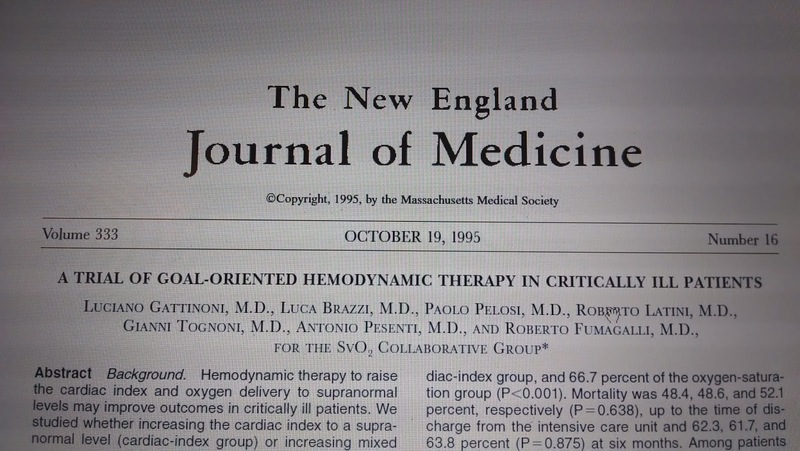 To quickly summarize, this was a single center dose ranging study the primary aim of which was to determine if esmolol could be titrated to a heart rate goal (primary outcome), presumably with the later goal of performing a phase 3 clinical trial to see if esmolol, titrated in such a fashion, could favorably influence clinical outcomes of interest. 154 patients with septic shock on high dose norepinephrine with a heart rate greater than 95 were enrolled, and heart rate was indeed lower in the esmolol group (P less than 0.001). Perhaps surprisingly, hemodynamic parameters, lactate clearance, and pressor and fluid requirements were (statistically significantly) improved in the esmolol group. Most surprising (and probably the reason why we find this published in JAMA rather than Critical Care Medicine - consider that outlier results such as this may get disproportionate attention), mortality in the esmolol group was 50% compared to 80% in the control group (P less than 0.001). The usual caveats apply here: a small study, a single center, lack of blinding. And regular readers will guess that I won't swallow the mortality difference. I'm a Bayesian (click here for a nice easy-to-use Bayesian calcluator), there's no biological precedent for such a finding and it's too big a bite for me to swallow. So I will go on the record here as stating that I'm betting against similar results in a larger trial. On the basis of these observations (and some preliminary studies described in the following paragraph), it was hypothesized that using available therapeutic tools (e.g., pressors and inotropes) to raise hemodynamic values to "supranormal" levels would provide benefit to patients. (The underlying hypothesis is really that supranormal hemodynamic values CAUSE improved survival - they are part of the causal pathway.) The italicized clause is pivotal. Even if the hypothesis is correct, it must also be the case that the therapeutic tools available to achieve those ends: a.) do so in a way that closely mimics the way the body has evolved to achieve supranormal values in survivors - i.e., there are not redundant causal pathways; b.) that any untoward effects of the available therapeutic tools do not negate their benefits - that is, there is not causal factor redundancy; c.) that there is not time dependency of causal pathways such that if the supranormal hemodynamic state is achieved too late, there is no effect - a runaway train has been released and "the horse is out of the barn". As is now well known, this therapeutic approach failed and its pursuit has largely been abandoned. Moreover, the Swan-Ganz catheter, used with such enthusiasm by those enamored of manipulating measured physiological variables (think of how many unmeasured variables there are for each one we can measure), was dropped like a bad habit after the publication, a year later, of the SUPPORT investigators' observational study in JAMA showing that its use was associated with increased mortality. I will leave it to interested readers to evaluate the supporting references and determine the strength of the biological plausibility of this hypothesis, since I've already said there is no biological precedent for a therapy such as this improving mortality in critical illness. But note the similarities in the reasoning of the two studies performed 18 years apart, but testing diametrically opposed hypotheses! Two to three days after admission, when all of the other clinical epiphenomena of sepsis have normalized (creatinine and electrolytes return to normal, lactate clears, patient up, eating, walking about) they often remain hypotensive (MAP less than 60) with a "pressor requirement"
In elderly patients with a DNR/DNI order, I have often elected to forego pressor therapy altogether from the outset, and remarkably, this older, frailer, co-morbidity laden population also does very well in spite of the "permissive hypotension"! The question nags us: Assuming esmolol were shown to improve outcomes in sepsis, is it just ameliorating some of the iatrogenic problems we're creating by normalizing physiological variables based on hypotheses predicated upon observational data and reductionist rodent studies? I cannot help but recognize that, in the last 20 years, we have in my estimation very few therapies/strategies in critical care medicine which have withstood scrutiny and the test of time and which improve outcomes. Intensive insulin therapy? Nope. Steroids in sepsis and shock? Huh uh. Low tidal volume ventilation? You betchya. Pronovost's approach to reducing line infections to a median of zero? Yep. Daily reductions of sedative infusions? Uh huh. Do you notice the same trend that I do? Looking at the last generation of research in critical care, we see that the most convincingly demonstrated efficacious therapies/strategies reduce the harm of other things we have been doing all along. The paradigm of successful therapies in critical care medicine has become: scale back therapies in critical care medicine. Sedation and paralysis? Reduce/avoid it and mobilize patients. High tidal volumes that make the blood gas look good? Lower them. Wanna prevent line infections? Remove the lines. There are several other interesting parallels in the evolution of paradigms in research that you can chew on in otherwise idle moments. Cardiologists came full circle with catecholamines in heart failure, first contraindicating beta-blockers and admitting patients for "dobutamine charges" (they did this at OSU in the 1990s at least) then later recognizing that catecholamines may be harmful in heart failure, and beta-blockers are beneficial. Maybe we're coming full circle just like they. Papazian et al borrowed a chapter from the cardiologists' playbook as reported in the Oct 23/30 issue of JAMA and sought to determine if statins (HMG-CoA-reductase inhibitors, namely simvastatin) could reduce VAP perhaps due to their pleiotropic effects. Why this outcome was selected is beyond the reaches of my vivid imagination, but in some ways I wish the study had been positive (with a better primary outcome), because it would lend support to another point I've been trying to make, namely that sometimes things "work" as we hypothesized, but our underlying hypothesis is still wrong - because of multiplicity of agent effects, it's working in a different way than we think it is (e.g., maybe statins improve heart outcomes because of effects other than lowering cholesterol). We have not seen the end of statins in pulmonary and critical care medicine, so stay tuned for more on this topic. In sum, perhaps intensivists should not be so eager to giveth.....then they would not have to work so hard to learn what to taketh away. Hi Scott, Wonderful blog, I love it. I was hoping this trial would be successful as I have been interested in the idea of beta blockers in sepsis, perhaps due to decrease in metabolic load, but perhaps due to inhibition of beta2 and beta3 receptors, not beta1. A non-specific beta blocker (propanolol?) might have fared better. The problem I've always encountered, however, is that every time I give a beta blocker to a patient in septic shock they become hypotensive and I worry about not practicing 'standard of care' if they should fare poorly. I think there's something fishy about this trial -- the extreme mortality rate in the control (and treated) group, as well as choosing decrease in HR as a primary endpoint - that was pretty lame. Final point - you state that Gattinoni's study stopped the interest in hyperdynamic therapies. I beg to differ - Rivers is a disciple of Shoemaker and EGDT is pretty much the same thing. Whether or not it is a valid construct is another matter. Great blog, Scott. I really want to believe this trial as I've been thinking about beta blockers in sepsis for some time but I agree that there are several things that bother me about it - the extremely high mortality rate, using HR reduction as a primary endpoint. What I don't get is, how come every time I give a beta blocker to a patient in sepsis I get hypotension - didn't seem to happen in this study. Presumably, dropping metabolic demand might be of benefit; however, I think that beta2 or beta3 receptors might be more important and perhaps something non-specific like propranolol could be of benefit. Also, not sure I agree with comment about Gattinoni study, although I appreciate the symmetry of the argument. It seems to me that Rivers is a disciple of Shoemaker and that EGDT is really just hyperdynamic therapy under a new guise. Whether you agree with it or not, it seems to me that this strategy has only changed its name. Erik - I share your concerns about beta blockers in septic shock in general, and I was truly surprised by the hemodynamic results in the article discussed above. But I've also come to recognize how ignorant and naive I/we are, so I don't put a lot of creedence in my superficial notions of what may be biologically plausible or not. (I do however pay a lot of attention to observations such as those you have made - IV beta blockers in the acutely ill can lead to catastrophic hemodynamic collapse, and I've seen it several times.) This is why I focus more on biological precedent. And you could say, given the historical record in cardiology that there is precedent for beta-blockers being effective. I remain agnostic about this topic for now. But I think a parallel line of research should be to test the hypothesis that "permissive hypotension" especially in heavily sedated patients, is not inferior to, or is superior to, higher targets for managed hypotension.